When I was invited to spend a week sailing off the coast of Maine, I expected to make witty conversation as I toasted nattily-clad fellow passengers with a glass of vintage champagne. You know, like Walter Cronkite, or one of the Kennedys. The Schooner American EagleAfter all, what did I know about sailing? I grew up in Kansas and Nebraska, two states that are about as removed from the ocean as the Sahara is from the North Pole. 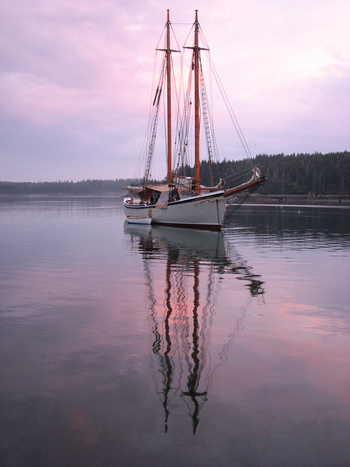 So you can imagine my surprise when I boarded the American Eagle, an authentic Maine windjammer. Seventy-five years ago she was hauling fish from one port to another; today she carries passengers on cruises around Penobscot Bay. Despite the loving restoration done by Captain John Foss, nothing can change the fact that I was going to be sleeping in a cabin carved out of the old cargo area, the same place that was once filled with dead fish. Like Dorothy, I wished I were back in Kansas. The first night I cracked my head when I sat up in bed. No headroom. The second day I strained my back when I helped hoist the sails. No know how. There were only a few canvas chairs on deck, so I found a place on the floor. Whoops — on the deck. "Wicked nice, isn't it?" asked one of the passengers, a born-and-bred New Englander who'd been sailing all his life. Wicked? That's when I learned that "wicked" means "very" in New England-speak and “cool” in hip-talk. But I’m neither a grizzled Yankee nor a young chick, and where I come from, the word "wicked" is used to describe the Witch of the West and serial murderers. But by the third day I was sea steady if not exactly sea savvy. When the wind blew hard, the boat seemed to fly, skimming over the water with deck tilted and passengers cheering and laughing. But mostly it moved slowly, giving a sensation of drifting—and dreaming. "You go ahead in and I'll stay on the boat and watch," I found myself telling my son, Maxx, as he jumped into the water with his snorkel gear. I had been feeling a bit anxious about my first snorkeling attempt, and as I looked at the others from our shore excursion group already looking confident in the water, I decided maybe this just wasn't for me. Maxx and I were on a Carnival Cruise together. It was my idea to take him on a cruise for his sixteenth birthday—just the two of us on a mother-son bonding trip. He loves to travel and since he had never been on a cruise before, he was excited. So was I. I was hoping this trip would help clear some of the awkwardness that often sets in between moms and their teenage sons. It's funny, but not so long ago, I was one of Maxx's favorite people. We would spend hours building with Lincoln Logs and Lego's. He couldn't wait to tell me all about his day at school. He used to share his thoughts and dreams with me. At one time, he even asked my advice regularly. However, as parents know, life with kids is definitely a journey with many stages. With Maxx, we are currently in the "I don't need mom for anything anymore" stage (except maybe help with homework). In my mind, the cruise was sure to change all that. But there I was, sitting on the side of the snorkeling excursion boat by myself while Maxx flippered away. What a metaphor for our relationship. I had to do something to add a little glue to our bond. "Ok, I'm coming in!" I said. Thankfully, one of the snorkel guides was nearby as I jumped in and immediately lost my snorkel. 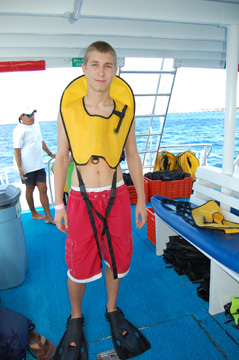 I watched it sink toward the bottom of the sea and of course, I couldn't plunge in after it with my life vest on. Quick as a fish, the guide dove down and retrieved it. Whew! How embarrassing! I was glad Maxx didn't see me do that. So you know me: always the first landlubber to hop off the ship, soon as it docks. But there I am, your Lazy Highness, hangin’ off the balcony, watching three hundred Holland America passengers trudge into Old San Juan, Puerto Rico. Me? I’m headin’ straight to the cool blue pool for a mojito and a nap. photo via flickr by FloodkOffThree mojitos later, Jennifer pinches my ankle. Even my best friend can be annoying sometimes. “Kayak in the dark?” I mumble. “Why? At sunset, we take a bus with the other passengers, and then scramble into those cheapo orange sit-on-top kayaks. “Follow me,” calls Carlos. He’s one of those too good-looking guides you think about seducing, but not in a kayak, I guess.